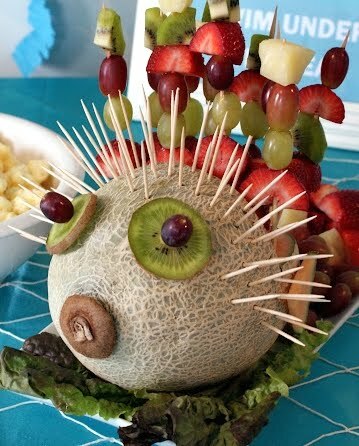 Fun and decorative beach party foods. They're cute & clever. Everyone will love them! 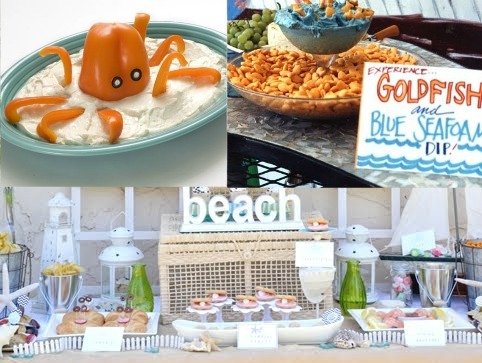 These fun beach theme foods sure are entertaining and perfect for a beach theme summer party, or a beachy birthday party anytime of the year. 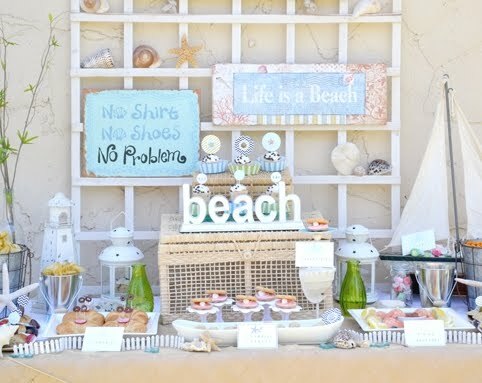 Let's start with Cris' Beach Party that she threw for her husband's birthday. Sweet and salty treats were served. 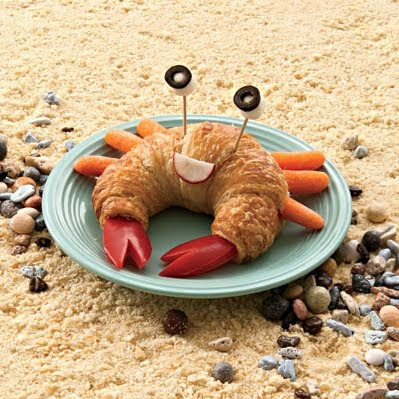 Including the crabby croissants from Family Fun. Baby carrots form the legs and the claws are red bell peppers. Pop over to Cris' blog to check out all the other beach party foods she put on the table. 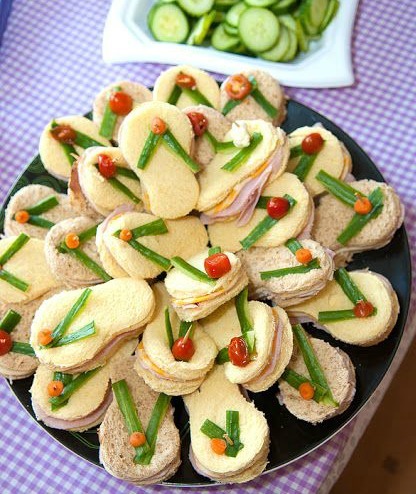 Adorable flip flop sandwiches. Via Pretti Mini. The sandwiches were created with flip flop Cookie Cutters. 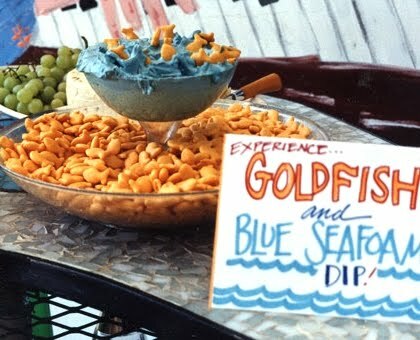 At Willis Wonderland Goldfish are diving into an ocean of blue food colored onion dip. And how cute is this crunchy Dip. Also via Family Fun. 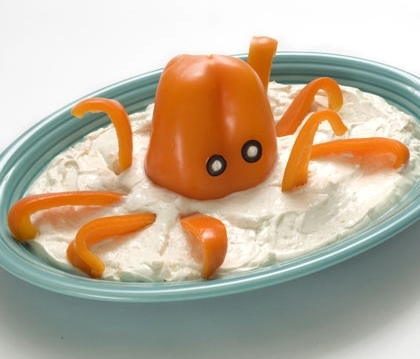 Who knew that a Bell pepper could have a life as an octopus. One more idea from Family Fun. 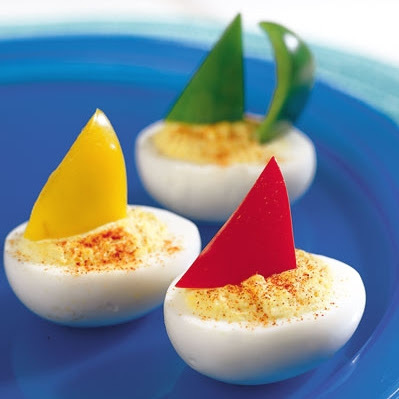 Deviled Egg Boats. 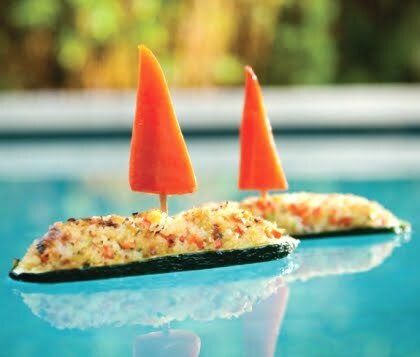 Then, Zucchini boats from the free downloadable book A Very Veggie World. You'll find the recipe there. The filling includes couscous and the sails are made of carrots. 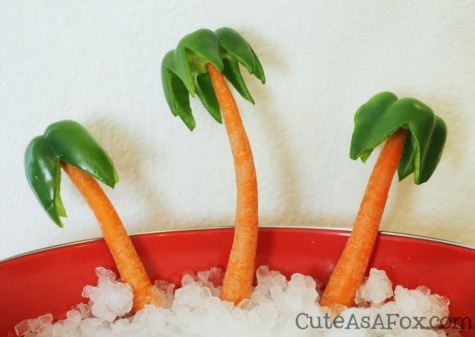 Serve carrot and pepper palm trees on ice for a refreshing vegetable snack. By Cute as a Fox, original source unknown. Tropical with an Asian twist. Classic Thai Pineapple Fried Rice. Jasmine rice is fried up with chunks of pineapple, cashews, and veggies. Sounds yummy and looks great. The most delightful fruit kabob. It is the star of this Under the Sea Party. 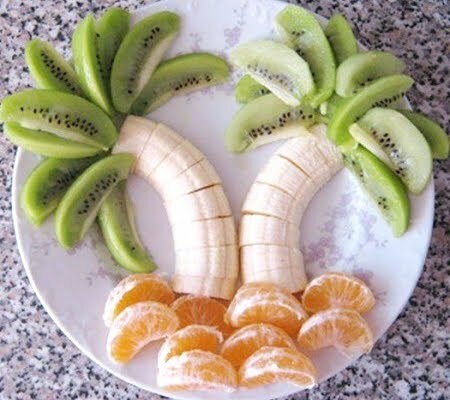 Tropical fruit creations make for a healthy beach party snack. Original source of image unknown. 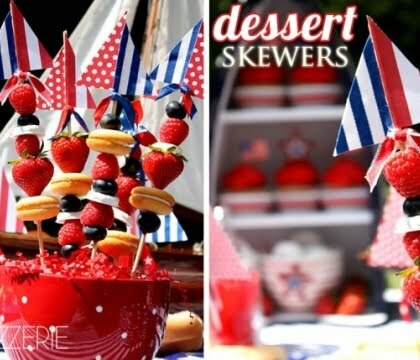 Yummy bites on sail skewers at Pizzazzerie for a 4th of July party. And for an easy beach theme cookie treat, try Sand Dollar Cookies. All you need is refrigerator Pillsbury sugar cookie dough and a bag of slivered almonds. Or how about cute Flip Flop Cookies as a Party Dessert. Simply add strips to oval shaped cookies with Icing. The sandcastles was made by Packing Brown Sugar into a Sand Castle Mold. 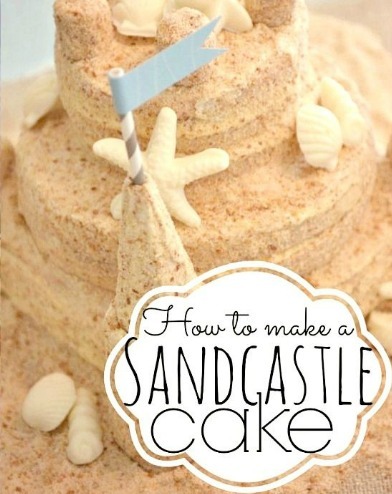 Make a Sandcastle Cake for the beach enthusiast. Works for a birthday and a beach summer party. 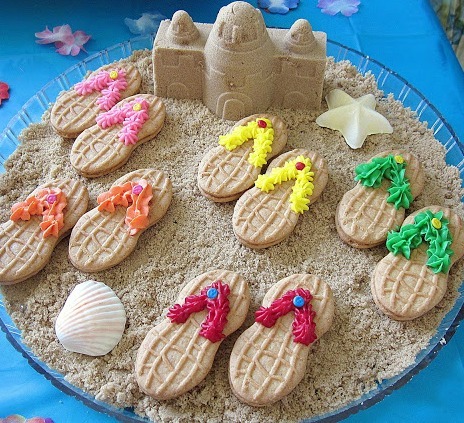 Also see Sand Castle Centerpieces where you will find another recipe.